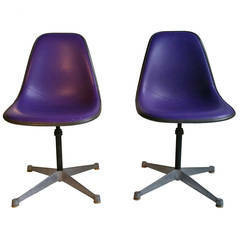 Pair of Charles and Ray Eames swivel padded arm shell chairs, unusual color combination, early brown exposed fiberglass shells. Mustard yellow fabric covers, gray piping, early four star aluminium base, retains original Herman Miller label. Charles Eames and Ray Eames were the embodiment of the inventiveness, energy and optimism at the heart of mid-century modern American design, and have been recognized as the most influential designers of the 20th century. As furniture designers, filmmakers, artists, textile and graphic designers and even toy and puzzle makers, the Eameses were a visionary and effective force for the notion that design should be an agent of positive change. They are the happy, ever-curious, ever-adventurous faces of modernism. Charles studied architecture and industrial design. Ray (née Beatrice Alexandra Kaiser) was an artist, who studied under the abstract expressionist Hans Hofmann. They met in 1940 at the Cranbrook Academy of Art in suburban Detroit (where Charles also met his frequent collaborator Eero Saarinen and the artist and designer Harry Bertoia) and married the next year. His technical skills and her artistic flair were wonderfully complementary. They moved to Los Angeles in 1941, where Charles worked on set design for MGM. In the evenings at their apartment, they experimented with molded plywood using a handmade heat-and-pressurization device they called the “Kazam!” machine. The next year, they won a contract from the U.S. Navy for lightweight plywood leg splints for wounded servicemen — they are coveted collectibles today; more so those that Ray used to make sculptures. The Navy contract allowed Charles to open a professional studio, and the attention-grabbing plywood furniture the firm produced prompted George Nelson, the director of design of the furniture-maker Herman Miller Inc., to enlist Charles and (by association, if not by contract) Ray in 1946. Some of the first Eames items to emerge from Herman Miller are now classics: the “LCW,” or Lounge Chair Wood, and the “DCM,” or Dining Chair Metal, supported by tubular steel. The Eameses eagerly embraced new technology and materials, and one of their peculiar talents was to imbue their supremely modern design with references to folk traditions. Their “Wire Chair” group of the 1950s, for example, was inspired by basket weaving techniques. The populist notion of “good design for all” drove their “Molded Fiberglass” chair series that same decade, and also produced the organic-form, ever-delightful “La Chaise.” In 1956 the “Lounge Chair” and ottoman appeared — the supremely comfortable plywood-base-and-leather-upholstery creation that will likely live in homes as long as there are people with good taste and sense. Charles Eames once said, “The role of the designer is that of a very good, thoughtful host anticipating the needs of his guests.” For very good collectors and thoughtful interior designers, a piece of design by the Eameses, the closer produced to original conception the better, is almost de rigueur — for its beauty and comfort, and not least as a tribute to the creative legacy and enduring influence of Charles and Ray Eames. Impeccable molded swiveling armchair by Charles and Ray Eames for Herman Miller. Contractor base model. Ray and Charles Eames tilt and swivel office chair. Dated 1982. Chair measures 25&quot; wide, 21.5&quot; deep. It's currently 32&quot; high and seat height is 16.5&quot;.